I was among the fortunate who were blessed with a new lunchbox every year, and looking back – it was interesting the gimmicks and devices that were used to sell things to us to occupy those lunchboxes year after year. I’m sure you already know where I’m going with this: Ecto-Cooler. I could wax nostalgic for pages and pages about all the food stuffs that were available for my school lunch as a kid (Dunkaroos, Fruit by the Foot), but from around 1981 to 1990ish, there was a war being fought on the grocery store shelves. The war to be the sugar water “drink” of choice in kids’ lunchboxes. Think about it, Hi-C, Kool-Aid, Squeez-It, Capri-Sun, I could go on and on with the options that were available for kids to implore their parents to buy for them. Each, of course, had some sort of a gimmick that set them apart from their competition in the hopes that maybe leading you to obesity or diabetes in pouch form would be more appealing than the other guys. I remember, as a kid, the “juice” isle stretched as far as the eye could see, with all sorts of juice box, pouch, and bottle options to choose from. It only makes sense that the marketing folks would spend countless dollars to make you identify their brand above all others. (Now, juice boxes are relegated to an end cap or a small shelf next to the “real” juices… interesting, no?). But while Squeez-It and Capri-Sun had unique packaging that was immediately identifiable, Kool-Aid and Hi-C stuck to the tried and true juice box format. So what could they do to get notice? Kool-Aid opted for awesome advertising with the oft Seth MacFarlane parodied Kool-Aid Man, who became more identifiable than any of the flavored drinks they sold. Plus Kool-Aid devised the genius idea of Kool-Aid points, which you could redeem packages of their juices for “Kool” (nyuck, nyuck) usually Kool-Aid Man themed gear. Hi-C, on the other hand, had me sold the minute they developed a Ghostbusters themed beverage in Ecto-Cooler. It’s a pretty genius idea, actually. When you think about it on the simplest level, the drink has absolutely nothing to do with the Ghostbusters property. The first thing that comes to mind when seeing the mucus-like ectoplasm in the Ghostbusters film and in the animated show isn’t “citrus tangerine goodness.” (Unless there’s something the fan community isn’t telling me?) The drink wasn’t even really the same green color as your favorite paranormal entity and mine. But it didn’t matter, the minute they slapped Slimer on the packaging and named the flavor “Ecto-Anything,” it was sold to me. Having had parents with a strict “milk once a day” rule – Ecto-Cooler at lunch meant that I had to endure drinking low-fat milk for dinner every night, but I didn’t care. It was worth it. Ecto-Cooler made me feel cool. Like I was drinking an officially endorsed drink from the Ghostbusters. No matter what a dweeb I actually was in real life, I was a Ghostbuster at lunch. Which, okay, arguably still made me quite the dweeb. But endearingly so, right? Right? It probably makes me beyond shallow, but Ecto-Cooler became associated with childhood, it became associated with a simpler and more enjoyable time. Much like a generation before me drank YooHoo, I drank Ecto-Cooler. Of course, once the bane of our existence known as “nutrition” became a concern for families everywhere, the portion sizes of Ecto-Cooler slowly diminished. The boxes went from being monolith-sized, to matchbox-sized. Shortly after that, it ceased to be a juice and became a soft drink. It even suddenly became “An Excellent Source of Vitamin-C” (and pure sucrose by the tablespoon, probably) before eventually disappearing completely. It was missed, but life went on as juice boxes gave way eventually to Kool-Aid Koolers, which eventually gave way to it being cool to buy my lunch and drink school sanctioned milk, which gave way to a soda machine in high school, which eventually gave way to… I don’t know… girls. There was a time around 2002 or 2003ish that Ecto-Cooler made a quiet and understated return, re-themed and renamed Screamin’ Tangerine. And I’m not ashamed to say that I, Troy Benjamin, at that time about to graduate from college, bought juice boxes by the case full. It was all a desperate attempt to take myself back to that moment in my childhood that Ecto-Cooler reminded me of. Okay, well and when we discovered how good Ecto-Cooler and Vodka combined; it also became a means to inebriation. But it’s strange to think that a marketing ploy during a highly competitive era where beverage companies were throwing everything at the wall to see what stuck became associated in such ways. And it’s funny how much I want it back. The Private Sector: Where Has All the Pyrotechnic Fluid Gone? Sure it’s crowded, it’s dirty, and there’s people here that would just assume step on your face than look at you, but one of the benefits of living in Los Angeles is the incredible wealth of talent, especially when it comes to “movie magic,” that calls such a place like Los Angeles home. This past Saturday, some of the greatest talents in the visual effects business gathered for the Visual Effects Society’s “25th (and 1/2) Anniversary” Screening of Ghostbusters at the Billy Wilder Theater in Westwood. The event, which was touted as a screening and Q&A session with “special guests” turned into an impromptu reunion of the Boss Films crew, the former Marina Del Rey folks behind the visual effects of Ghostbusters, 2010, and their final project Alien 3. It goes without saying that the event was memorable - from stories of the complicated process in which the Stay Puft costume was engulfed in flame (“We… uh… put gasoline on him… and lit him up.”) to the wealth of fantastic archival photos by Virgil Mirano, which were expertly (and far too quickly) piloted by fellow DVD producer and visual effects magician Van Ling. But what I really took away from the reunion/screening was just how fun the process of making movies used to be. It’s funny seeing the twinkle in Richard Edlund’s eye when he reflects upon his time spent building Boss Studios from the ground up specifically for Ghostbusters and 2010, especially considering that Edlund is one of the greatest proponents of a digital, non-photo chemical, visual effects age. You get the feeling that he, and all of the participants that were on stage at the event, loved the challenge that having to produce everything optically presented. And when you stop and think about it, why wouldn’t they? If given the choice between being on a soundstage and rigging a solid-steel model of a Central Park West apartment building with explosives – then blowing the thing to kingdom come… or sitting and having a team of twelve animators at ILM digitally create the explosion frame by frame, I think the former is quite a bit more exciting than the latter. There was one point in the moderated panel where the crew was discussing the challenge of animating the “rubberized light” beams that emit from the Ghostbusters particle accelerators. The solution, as described, was that the weapon was actually sucking atoms and particles from the area in which it was pointed so the pyrotechnics that were assembled on-set were made to look more like something “pulling” from the sets and less like the impact of an explosion (and, if you frame-by-frame through the DVD, you’ll notice the actual animated streams actually start on the wall and THEN link back to the proton gun three frames later). Fascinating and fun anecdotes that I had never known, and each person on the panel spoke of the process with a childlike glee. But even taking that “fun aspect” out of it, one could argue that better and more effective work was produced when there was a challenge presented to the filmmakers. Can you imagine Steven Spielberg’s Jaws if the mechanical shark was computer generated and didn’t present any problems? How about Ridley Scott’s Alien film if he wasn’t hiding the man in a suit in the dark shadows of the Nostromo? I’ve vented at great lengths elsewhere (and frequently) about how computer generated effects have freed up (but become a handicap for) visionary filmmakers, so I won’t venture into that territory again. But I think that the point is clear: they just don’t make ‘em like they used to. That much was abundantly clear in seeing and hearing the former wizards of Boss Films wax nostalgic on their Ghostbusters work. It was challenging, it was stressful, the pressure was insurmountable, and the fate of both their studio and others hung in the balance… yet twenty-five odd years later they are all still able to come together and the result is akin to a family reunion. Because despite all that hardship, they still had a helluva time. Here’s hoping that the folks already hard at work on a third installment of this famed franchise take into account the challenge, and don’t take any of the shortcuts available in this modern era of filmmaking for granted… well… okay… and that they have a helluva time doing so. Michael C. Gross, the long-time art director for the National Lampoon and executive producer of the Ghostbusters films (and is the man responsible for the no-ghost logo that adorns many a product to date) was gracious enough to give an interview to GBHQ representative Neil Vitale, best I can figure somewhere around 2000. Presented here is the interview as it was on the website at the time (spelling errors and all, with few annotations added). NV : How did the Real Ghostbusters show come about? Was it the next logical step after the film became such a big success? MG : The first movie was made when there was no idea of doing a second movie. One of the surprises of the first movie was the appeal to kids. In fact at the first preview screening we saw kids there and thought they might find it too scary. When the scary parts (to a kid) were then diffused by a joke and silly laughter...kids loved the release. It also became a useful tool for parents to use so little kids would be less afraid of things that go bump in the night. So here we were, no sequel in mind, kids, a few toys (nothing much because we didn't pre sell something that didn't seem ok to kids). So..... folks who made livings from developing cartoons from movies came along and convinced us... and THEN a toy deal could fall into place. NV : How long did this cartoon take to plan before it went on the air? Was it tough to cast the show, where you trying to find voice actors who sounded like their live action counterparts, etc? I think I speak for all of us when I say that this is the BEST movie to toon adaption ever done. Plus it really expanded on Winston's character to boot. MG : It went into quick production. Columbia TV and we (Ivan's people) looked at production companies that could deliver 64 shows for syndication. (the ABC deal was yet to be made) and in a few months we were off and running. Joe Strazinski was hot to be story editor and not only was talented and funny, but respected and understood the movie. Ivan is particularly good at casting and put the final approval on the voices. Arsenio Hall was easy to pick (he auditioned for the movie but was thought to be a bit young). The other guys were able to do multiple voices and were improve comedians as well, so tweaking the scripts on set became easy. Expanding on Winston and Janine was easy on TV because you needed to come up with new plots and you had lots and lots of time (episodes). NV : This is a most asked question. Why was the show changed to a more toonified look in season 3 and focusing soley on the adventures of Slimer? I like to refer to it as the Scrappy Doo years of the GB franchise. It tried to bounce back to the story structure of the first two seasons toward the end with 'Slimer and the Real Ghostbusters', but do you think it really recovered from the change over? I'm curious as to wether it was a network decision or a creative one. MG : Well your questions about the "toonification" is interesting. Part of it was this...the show was simultaneously sold to syndication AND ABC... it had never happened on TV. What this meant is the first season got on air on syndication and meant several things...not as much money for animation, so one in three shows would be difficult to watch (quality of animation, drawing etc) but always (I think) bailed out by the great writing. There was no standards and practices for syndication and the show was more adult. When the ABC shows were getting made (same creative team and production team) we had more bucks for animation but had to write a little more for Saturday morning (as it was then called). Meanwhile, Slimer became more popular with the kids. THEN.... the decision was made to go for a longer show....hence the more stylized (intentional) Slimer spots. The style and writing tone were to separate it more and keep the Slimer cartoons lighter. It then sort of ran out of steam (5 years in all on the air and 100 shows...let's face it, only the Simpson's outran us in the comedy animation world). MG : Annie's accent did not change. The hair changed because as a woman she was the only character We COULD change (thereby making her fresher). She was also developing as a leading smart heroin. The hair change was my idea and I always liked it. NV : From the Newsgroup: "Why wasn't Lorenzo Music used past the midpoint of the Real Ghostbusters?" MG : Lorenzo Music. First off let me say he was a wonderful, smart. Talented, Funny man. When we started the show we couldn't use the original film actors... too expensive, conflicting and busy schedules, etc. So the voices had to reflect the CHARACTERS not the actors. In (Bill's) Venk's case it was difficult to get the voice to go with the writing... but he was great. Then mid-way through production Bill was having lunch with Ivan Reitman and said how much he liked the show and said "why doesn't he sound like me?" We just assumed we wouldn't get permission and worked around it. Ivan came and told us to change it. Then because we had impressionists/comics doing the voices any way, we went for Bill and figured it wouldn't be the first time changes in a character would be made mid-season on Television. I missed Lorenzo.... on the other hand some people didn't care for him because his voice was so well known for Garfield among many other things. MG : I never even saw one episode of Extreme GB. It was a concept of Hasbro to try and revitalize the franchise to sell toys (I never saw a toy either). I think they may even have paid to get it produced, not sure. NV : What would you like to see released as extras on the animated Ghostbuster DVDs? Any particular forms, ala season sets or best ofs? Any current plans to put these out? NV : Last RGB question....There's supposedly a Ghostbuster Revival going on. A new Comic Book (editor's note: this was the 88MPH book at this point) has appeared, shifting away from the RGB Designs (Fans of Egons hair from the series are dissapointed), and going with a more movie toned look. If this is a success, do you think a new animated series based on the book can make it in todays toon market? MG : I haven't seen a new comic...can you send me one? I have no idea if it could come back to life... my feeling is no... that was then and this is now... new audiences, etc. NV : First of the Movie questions. What was it like working with these guys in their prime? Where they really as wild as reports during their Saturday Night Live days would have us believe? MG : No, not nearly. I knew Bill (and in fact John Belushi's wife was my assistant in my National Lampoon days) during those days... they WERE wild, By the time the movie was made, no one was wild anymore. NV : Dan Aykroyd is apparently really into ghosts and spooks, as is his brother Peter. I'm curious if he ever took you to a 'live haunted house' (no pun intended) as research for the movie? And have you had any real ghost encounters? MG : Danny talked a lot about the super natural and I'm aware of his brothers interest... but no we never did any thing approaching the subject. The closest thing we did for "research" was movies...we screened "Ghostbreakers" "Scared Stiff" (the same movie but with Jerry Lewis instead of Bob Hope... same script, director, some scenes even picked up)... and others. But actual haunted houses etc...no. NV : Who's idea was the 'Stay Puft Marshmallow Man'? One of the best movie ideas and designs ever. You just feel so sorry for the poor guy when he gets burned to bits. MG : Danny came up with Stay Puft in his very first draft. The actual design was figured out at the effects stage. We were very unsure of the idea all through filming...thought we might be crazy and we were worried... but the first screening calmed those fears...he went over HUGE... then we asked ourselves, how could we have doubted ourselves. NV : With CGI as prevalent as it is today, what type of Ghost effects do you think you can get away with compared to the 80's? Or do you think that CGI can ruin the 'realism' that a puppet or manaquin can represent? MG : No cgi has only made effects better. We struggled with transformations, etc.. today, kids stuff. On the other hand, it is a good example of how it is concept and writing that in the end count. 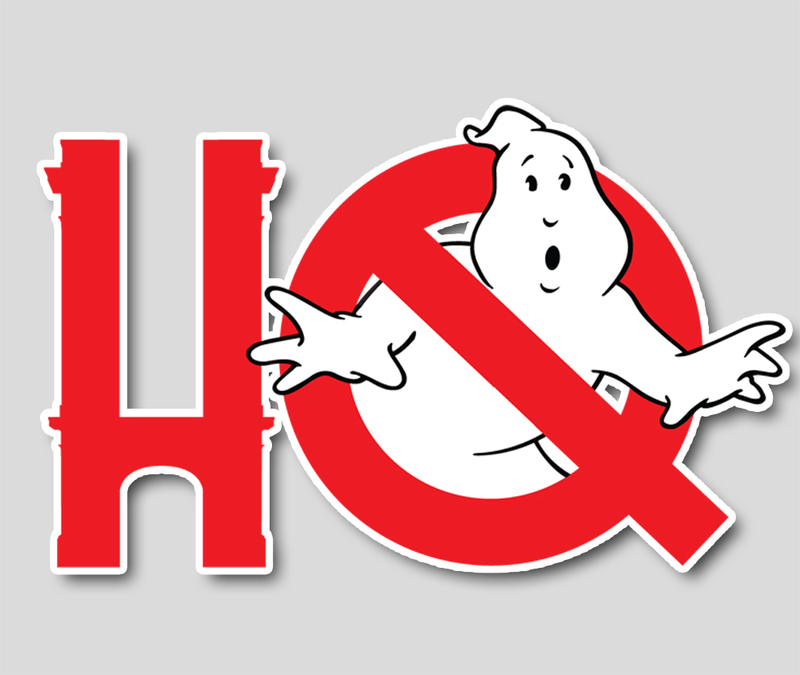 NV : Many people are wondering if a 20th anniversary DVD of Ghostbusters is in the works? I don't know why it would be needed since the first one, with the MST3K Style Commentary, is one of my favorites ever made. They are also hoping Ghostbusters 2 can get the same treatment..Is it possible to get the 4 guys to do a Cast Commentary for one of them if the first or second are ever re-released? MG : I think the DVD that exists is IT... anything else would be milking it. #2 with commentary? I don't know.... doubt it.... we've all gone our separate ways...but hey 6 years from now? First let's see who is still alive. MG : Only rumors about#3.... especially after EVOLUTION... ouch. NV : During the end Credits of Ghostbusters 2, we see what appear to be bloopers. (There's one of Murray dancing near a refridgerator). Do any bloopers of the two movies exist for a possible DVD re-release? MG : The bloopers (or more accurately outtakes or scenes cut) probably are in the vaults...I don't know. Sony doesn't even speak to me..... I didn't consult on HEAVY METAL for instance. NV : If there where a Ghostbusters 3, what direction would you like to see it go in? All new Cast? All new villains? MG : Too hypothetical a question.....but my guess is that it would have to be so different it would have to take place on Mars. NV : Winston was really developed as a Character in RGB. How come he never had a big enough role in the movies, and did Ernie Hudson have any input for his animated counterpart? Did he give you any feedback on it after he had a chance to see the series?" MG : No Ernie was just acting in it, not particularly concerned about enlarging the role, etc. He's a GREAT guy by the way. If you study the structure of movies you can see why there is no room to enlarge any character when there are that many in a feature (90 minutes, three acts, remember? ).